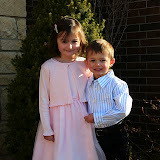 Here are the photos that we took on Easter. We got some descent ones when they were by themselves, but when I put them together they did nothing but act like goof balls. We also had a fun time doing a big easter egg hunt out at our cousin’s house. Gavin got 2nd place. I believe Halee got 3rd. They both came away with quite a few good treats and toys. Enjoy the photos! !